Lots of newer murals are adorning walls in Uptown, mostly on car repair businesses. Many of them are primarily intricate signatures which I still haven't learned to read. This comical wall is more accessible, regardless of whether or not you like it. Frankly, all those smiles and sharp teeth make me laugh. Another mobile mural found in West Oakland. This one on a hippy bus that appeared to be someone's traveling house. Shades of Ken Kesey and the Merry Pranksters. Spotted at last year's Temescal Street Fair. I'm always impressed with folks who dedicate themselves to preserving and promoting traditional crafts. 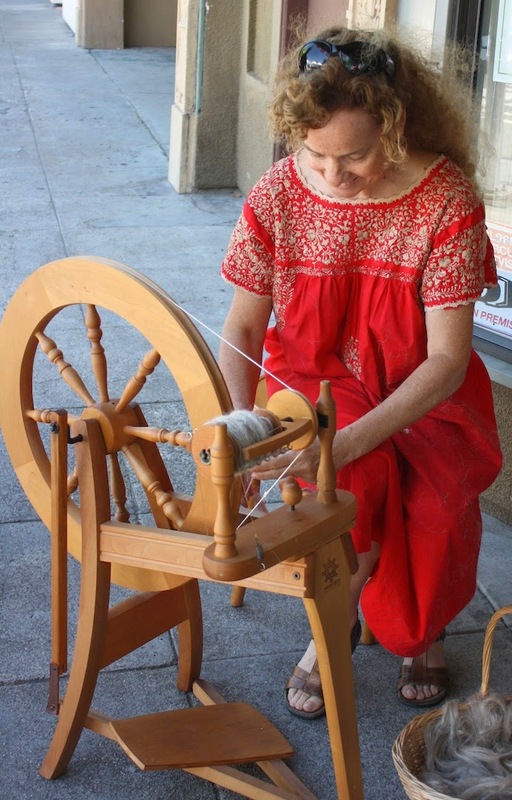 Spinning and then weaving are not easy. This year's fair is coming up soon in July. Linked to ABC Wednesday. This mural is next to the one shown last week. The distinguished man along side the Black Panthers is A. Philip Randolph, a civil rights leader, who organized and unionized the railroad porters. This West Oakland mural commemorates the Black Panther Party which emerged in the late 60s and endured until the early 80s. It was a self-determination movement born in West Oakland with a more radicalized agenda than the non-violent civil rights movement of the time. While it devolved into armed conflicts, it also had a significant impact on the social zeitgeist of the time that moved forward the cause of civil rights for many disenfranchised groups. Although long dissolved, West Oakland continues to be proud of its history in this movement. It's been a long time since I've seen a California raisin. Back in the 80s when the advertising campaign was hot, you could find every manner of California raisins including toys, t-shirts, and decals. Now, not so much. So imagine my surprise to find a surfing raisin on a new mural. I think the signature says Mick. The brown waves and sea monsters spell out his name. So clever.